In 2005, whilst Lorn was still only 19, yet he had attracted the attention of NFL Europa Scouts. Lorn had a limited knowledge of the game of American Football, but his natural ability lead to him being asked to attend an Oakland Raiders training camp. He became the youngest player to sign to an NFL roster. All with less than a year of experience of American Football. Lorn was celebrating New Year’s Day 2007 with friends in a nightclub in Islington. A case of the wrong person at the wrong time left Lorn as one of the worst affected by the senseless violence. Bullets hit his chest, pelvis, legs and arms leaving him with a four month stay recovery period in hospital unable to move his right leg and struggling to grip with his left hand. Lorn spent 4 months in hospital and hard work developing his own physiotherapy, Lorn managed to regain his grip and some movement in his leg. He can now walk with the aid of a walking stick. When he isn’t working hard for a degree in Construction Management at the University of London or starting a family by raising for his 11 month old daughter, Lorn is practicing with one goal in mind. Rio. He is training multiple times per week with Alison O’Riordan. 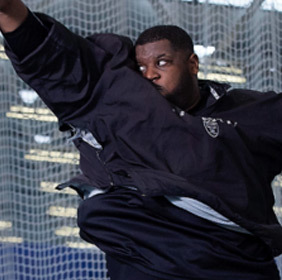 Alison previously coached two throwers into the GB Paralympic team for London 2012 and believes that Lorn has the ability to be a strong contender for this year’s Paralympic games in Rio de Janeiro. The 30 year old, restricted by his current supportive boot, is just one meter off the qualifying distance for Paralympic competition. He is soon to be the recipient of a bespoke leg brace that is designed for shotput throwing. It will then be down to Lorn to meet the qualifying distance, something that the Matt Hampson Foundation has no doubts he can achieve!